For some reason, the popular North American perception of Italian cars does not include practical things like sedans and hatchbacks, which is likely part of the reason why attempts to sell them have rarely been very successful. But what do these people who are responsible for the perceptions of the majority think Italian drive when they have a family, or can’t afford a sports car? Golfs and Corollas? Well, that’s probably true in the current market, but 40 years ago, they drove things like an Alfa Romeo Berlina. 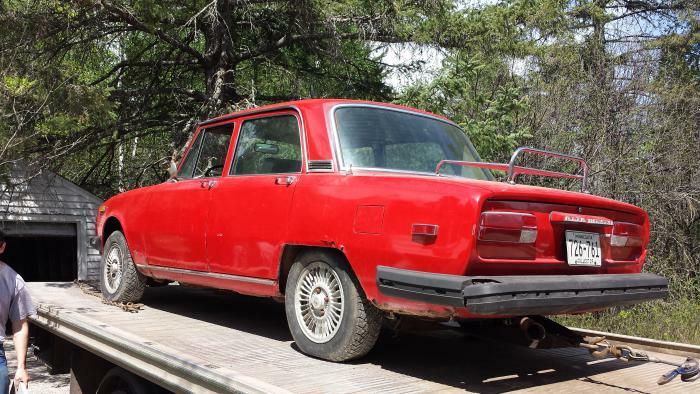 Check out this 1974 Alfa Romeo Berlina for sale for $1500 in Duluth, MN. If your Italian car is not going to be a two-door sports car, it should at least have red paint, right? While Berlinas were offered in a regular red over the years, odds are better this car has been repainted red from some other color, like white, olive green metallic, or plum. Not many details are given, other than it’s been stored for the last 8 years, and a professional condition report is available on request. It does look somewhat rusty, although it’s hard to tell how bad things are – the area behind the rear wheel does give some cause for concern, as it looks like someone did a quick patch-up and respray. You can debate all you like about whether it’s better built, but Alfa certainly did a better-looking interior than contemporary BMW and Mercedes. 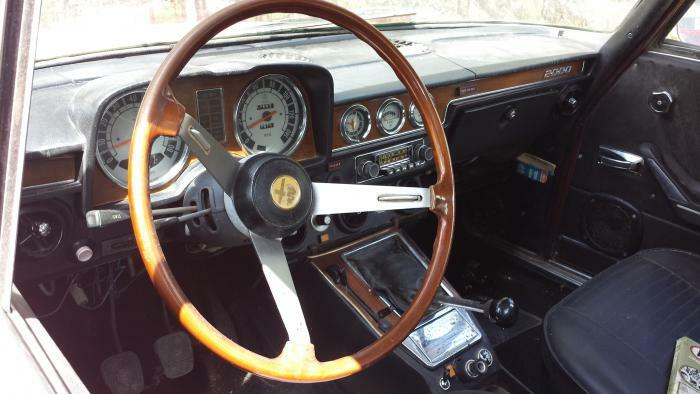 Some Alfa folks like the earlier Berlina dashes better, and there’s something cool about having those three gauges on the center console, but even this hews pretty closely to what was defined in the spider and GTV. This looks to be an air-conditioned car, which does add weight and complexity, but makes it easier to use frequently if you live in a hot or humid climate. What little you can see of the interior bodes well for its condition, so you can focus on getting the body (and possibly engine) right. This entry was posted on June 13, 2014 at 1:27 pm and is filed under Feature. You can follow any responses to this entry through the RSS 2.0 feed. You can leave a response, or trackback from your own site. I love these cars and I could actually afford this one if it wasn’t so far away, but they salt the roads in Minnesota like theater popcorn. I suspect this one is a crusty mess up close.